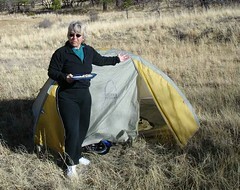 Here's Nancy inviting you into our Sierra Designs Lightning tent. No, it's not very big. But it works. You need to be very friendly with your partner to use this one. Our criteria for choosing this tent: We wanted something light , warm enough on the cold nights, but not a terrible condensation machine. It's really light. Maybe not warm enough on the cold nights (although we've been out below freezing on two recent nights) and maybe not good enough on the condensation angle. We've had a couple of nights where the condensation was quite surprising. I think you probably can't have everything!